No matter how long you’ve been with your SO, it’s hard to be original when planning date night. You’ve done allllll of the picnics, candlelit dinners, and movies, and you know you need to up your A-game if you want to seriously impress. 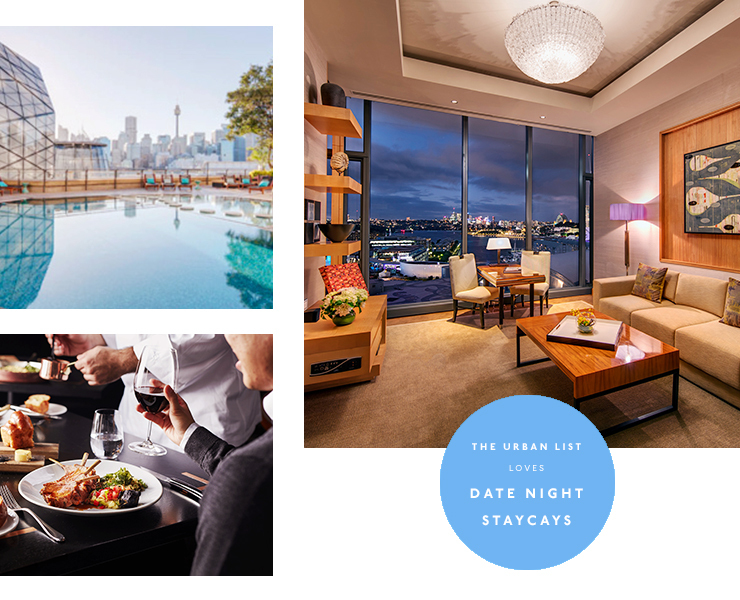 Lucky for you, we’ve teamed up with The Star Sydney to plan the ultimate date night staycay in Sydney AKA the world’s best date. FYI this plan works best if it’s a complete surprise. If you’re planning a date night staycay you should probs have been dating your leading lady/main man for at least six months (you don’t want to come on too strong, LBH). If you don’t have a date, just drag along a mate, duh. This one’s a given. Every good staycay involves a night at a chic hotel, and in total Sydney style, you’ll need a room with an epic view (like the Stellar Suites at The Darling or Star Suites at The Astral). Hot tip: watch the sunset (or rise!) from bed for allllll the romantic vibes. Sydney winter is nowhere to be seen so make the most of the sunshine and the unusually warm weather by spending the entire day bonding at the hotel pool. Don’t forget to slip, slop, slap. If you’re treating your date to a staycay, go all out and book in some time at a spa. The Darling Spa is the perfect place to pamper your date. Their extensive treatment menu offers everything from indulgent massages to ultra-luxurious La Prairie caviar facials, but the spa autumn indulgence pack (think body exfoliation, body wrap and a massage) is obvs where it’s at. At this point of the date, you’ve already won but you might as well bag some extra brownie points with a fancy dinner. Secure a seat at Balla for a delicious three-course Italiano feast, starting with a classic aperitif, for only $95. Or, kick back at BLACK Bar and Grill with a drool-worthy banquet for $150 per person—we’re talking garlic prawns to start, braised saltbush lamb with fire-roasted vegetables for main, followed by bread and butter pudding for dessert! Did we mention it includes a Negroni or martini on arrival PLUS a whiskey flight to end? Sign. Us. Up. The best part about a date night staycay is you can stuff yourself silly at dinner then roll home to bed, sleep it all off then do it all again. Sounds like a date night success story to us.